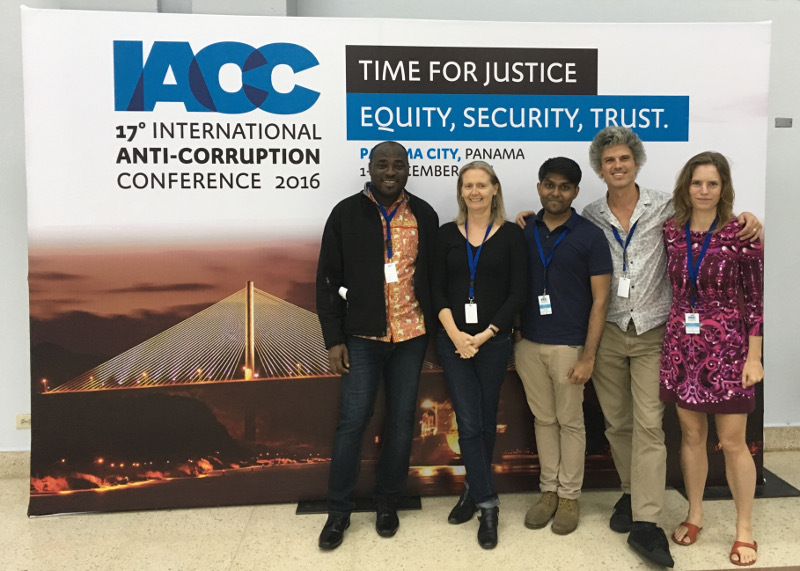 The Video4Change network organized a panel at Transparency International’s 17th International Anti-Corruption Conference (IACC) in Panama on the subject, ‘Exposing Corruption with Digital Video: How citizens can use the tool in their pockets to expose corruption’. 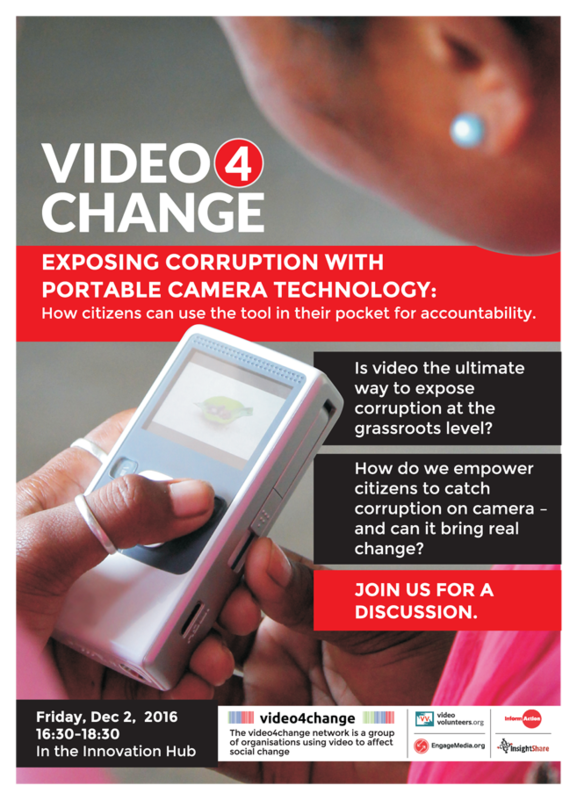 In December 2016, the Video4Change (V4C) network organized a panel at Transparency International’s 17th International Anti-Corruption Conference (IACC) in Panama on the subject, ‘Exposing Corruption with Digital Video: How citizens can use the tool in their pockets to expose corruption’. Five V4C partners attended the conference – InsightShare, Video Volunteers, InformAction, EngageMedia and KOMAS, who organized the anti-corruption film festival. We were also joined on the panel by Michael Okai, who had worked on an InsightShare project in Ghana. It seemed important to us that V4C continues to seek participation in mainstream international conferences when there is a direct link to the ‘Video for Change’ movement. Our V4C team learned it’s not always comfortable being an activist team in this type of conference, but that our contribution was unique, had impact, and attracted interest as on-the-ground representation. One of the main takeaways was the level of interest shown by young videographers wanting to be part of V4C. It led to discussions about the potential for V4C to broaden its membership-only network and to include a wider platform that people could sign into for support, resources etc. The cost would be very minimal and the reach would be significant. It would be good support for the growing number of young, relatively isolated videographers operating in different environments. Already, at the conference, people were eager to join. 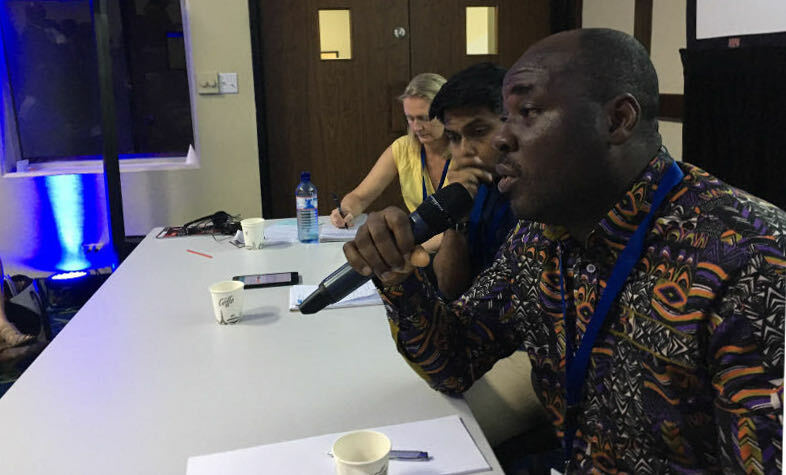 For instance, after the presentation, V4C team members were approached for interviews by young journalists at the conference on the use of film to fight corruption and working with youth. The V4C members plan to follow up on the interviews for fundraising and to show V4C impact. The team was also approached by a number of young videographers who are doing the type of social justice/change work V4C represents, and wanted to be part of the network or know more about it. They are looking for the support of an international network – especially important in these tough times with civic space closing and it becoming less easy for videographers, who often work on their own. We discussed how to create an extended V4C platform that is easily accessible, does not require membership, and further internationalises and broadens the network without significant cost or maintenance. The InformAction presentation focused on the different uses and strategies of video evidence – one of the key themes from the V4C Mexico conference. A clip used during their presentation at the IACC was a graphic demonstration of corruption by security forces in Kenya, taken during a security operation. It drew a fiercely defensive reaction from a Kenyan MP and the Chair of the African Parliamentary Anti-Corruption Committee, who tried to disrupt the session, including making a legal threat related to the filming. This can be taken as indicative of the increasingly repressive approach by governments toward the video for change movement. Governments are finding ways to use laws – re-hashing the old, or being creative with the new (particularly anti-terror legislation) – to restrict filming. Restricting the ‘right to record’ is a very serious threat. Governments are getting wise – and angry – to the power of camera technology, and coming down heavily on the people and organizations using it. In Kenya we are looking at a nasty and dishonest election trajectory, and were glad to meet up in December with fellow V4C WITNESS colleagues on filming strategies. One salient point was when a question was asked about how you get perpetrators to accept wrong doings on camera. This was a wakeup call for me, because participatory videoing is not like investigative journalism where you use stealth to record corruption. The answer lies in the genuineness of the storyteller. Victims and witnesses are given the opportunity to narrate their own stories and challenges. It is also important to seek answers from the other side, if they are ready to respond. Thus, victims are given a voice to ask questions. My experience with the V4C team has been very stimulating and enlightening. Different aspects of videoing for change came together as one. ‘Together as a team we can go far’. EngageMedia spoke on a video project called Moviemento, which trained youth communities in Indonesia campaigning on issues such as gender, the environment, social development, and culture. The youth would then produce their own videos with their perspectives on corruption. The project, which was funded by Transparency International Indonesia (TII), worked to give youth a voice on anti-corruption issues, as well as to strengthen active citizenship and the capacity for advocacy amongst TII’s partner organizations in Indonesia. Their presentation focused on the dynamic situations and methodologies they work with in their participatory projects with various communities, and was described in three parts: ‘Process vs Product’, ‘Storytelling vs Sermonizing’, and ‘Regionality vs Resource’. Video Volunteers (VV) shared its work on empowering communities to produce videos that expose local corruption. VV’s 200 community correspondents produce about 800 videos a year that deal with poor governance and mismanagement. One in five of these videos manages to solve the issue that the video addresses, a sure sign that V4C can reduce corruption. There were questions raised in our side event about both the opportunities and the risks of using video to “slay the monster” of corruption. Michael’s presentation on widows and land rights was an excellent demonstration on how corruption does not always look like the monster people expect it to be. Also of interest, the V4C team noted the “ethos” of the Panama conference focused almost exclusively on grand corruption, governments, big business, mainstream media and institutions. We felt that conference organizers need to be more engaged and understanding of activist organizations and agendas. Most video activists, using video as a social change tool, deal with the poor. Corruption at this level is known as “petty corruption”, a term that does not do justice to its magnitude and burden. The human rights approach emphasizes how the daily coercive element experienced by the poor is very different from the “grand” choices at the top and huge gains for the powerful. One powerful takeaway is that in many cases “coercive corruption” is a better term than “petty corruption”.